Analysis of agricultural activities in the Better Life Alliance (BLA) project in Zambia showed potential reduction in greenhouse gas emissions (GHG), mostly (85%) due to avoided savanna degradation and conversion. The GHG impact due to BLA’s interventions is estimated at –902,531 tCO2e/yr, equivalent to saving 2,089,550 barrels of oil.  BLA’s business model linked prevention of degradation and conversion of shrubland to market-based incentives for agricultural crops, thereby providing farmers with economic incentives for conservation and climate change mitigation.  BLA promoted a comprehensive approach to soil fertility management. It promoted agroecological approaches such as recycling farm organic resources, planting nitrogen-fixing trees, minimal tillage, and cover crops.  BLA reduced postharvest loss (PHL) through improved product processing, storage, and packaging. Changes in PHL were estimated for groundnuts (–100%), maize (–40%), rice (–80%), and soybeans (–67%), which contributed to decreases in emission intensity (GHG emissions per unit of production) for each of these products. Nash J, Grewer U, Bockel L, Galford G, Pirolli G, White J. 2016. 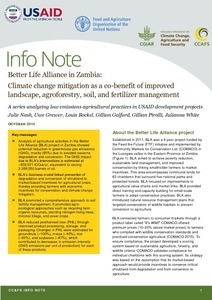 Better Life Alliance in Zambia: Climate change mitigation as a co-benefit of improved landscape, agroforestry, soil, and fertilizer management. CCAFS Info Note. Copenhagen, Denmark: International Center for Tropical Agriculture (CIAT) and the Food and Agriculture Organization of the United Nations (FAO).